This post is part of a series. See the introduction here: New normal, new teams, new goals. Since the beta release of GOV.UK in January 2012, the GOV.UK team has been hard at work building, scaling up and iterating the new single web domain for government services and information. For 3 years our priorities have been to to ensure that no users got left behind, while developing the platform to meet user needs that were previously served by the websites of the hundreds of departments and agencies transitioning to GOV.UK. With transition to the single domain complete and the election now in the past we've been reorganising our teams and redefining our goals and priorities for the year ahead. This is the beginning of a new phase for GOV.UK: our plans are no longer determined by the timetable of organisations transitioning onto the platform. Instead, we have to support an unprecedented number of users. Growth has been extraordinary - at around 80 million per month, GOV.UK now has more visits in a single month than there are people in the UK. Now that everything is in one place and hundreds of legacy government domains have been redirected to GOV.UK, we have the full data to be able to understand what's required to run and support GOV.UK to meet the needs of the millions of users, thousands of publishers and hundreds of service managers across government who rely on our platform every week. 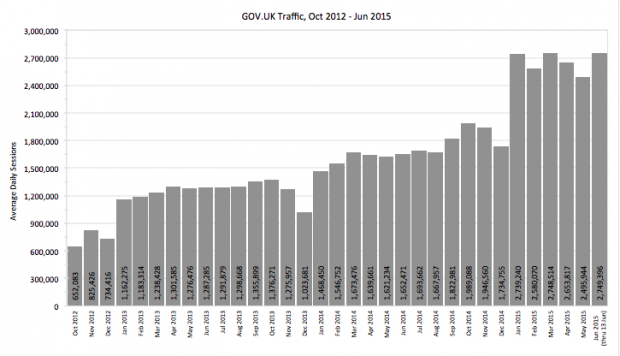 Daily traffic to www.gov.uk has increased from around 650 000 sessions per day at launch to 2.75 million sessions per day now. Our small user support team are handling 800 contacts per day from users of GOV.UK. That's double the average amount of contacts being submitted each day in the first 3 months after GOV.UK went live in October 2012. We resolve 97% of public contacts within 5 working days of receipt. GOV.UK is still new, and our focus until now has been on building minimal viable products to make the transition possible. We know there's much iterating and improving to do, but our first priority will always be to ensure the platform remains available, accessible, accurate, and secure. We’ve written more about how we’re setting ourselves up to do that, and our goals for the year, in separate blog posts. James Thornett is the Director of GOV.UK.